The latest research report by Zion Market Research (ZMR) states that the global encryption software market is demonstrating an extremely aggressive business environment with the charisma of a number of dominating market players. Microsoft, IBM, Gemalto, Sophos Ltd, Hewlett Packard Enterprise, Net App Inc, Oracle, Vormetric, Symantec, and Intel are some of the promising market players in the global encryption software market. With the growing production of mobile devices and cloud technology amongst numerous enterprises, the concerns related to the data protection are also on a tremendous rise. Furthermore, this increased production also increases the tendency toward the data violation, thievery & loss, cyber-attacks, and commercial intelligence across numerous firms. With the growing strength and quantity of commercial surveillance amongst industries related to their important data, the safety of the company data is an issue of the major significance. Thus, the introduction of numerous highly advanced data safety solutions is mandatory for various vital firms. Additionally, the stringent regulatory compliance amongst varied business verticals such as healthcare and BFSI has compelled the employment of data security solutions that are conforming to the particular standards. In 2015, the cloud-based deployment acquired the uppermost share in the encryption software market. It acquired about 40% of the market share in the global encryption software market. The encryption software market is being boosted by a number of elements such as growing requirement for fulfillment of the obligatory requirement of numerous organizations for data protection. The increasing requirement for cloud-based databases and cloud services also has propelled the global encryption software market. The growing danger of stealing of scholar data has driven numerous industries to accept the database encryption solutions, thus boosting the development of the global encryption software market in the forecast period. Data-at-rest application has the maximum market in common with the encryption software market. 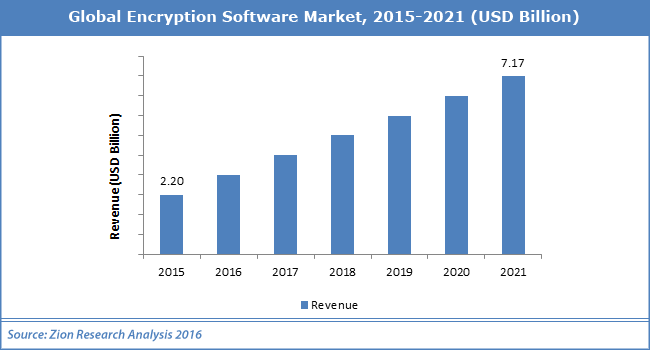 Data-at-rest encryption software is expected to show the significant share of the total encryption software market. For data-at-rest, the two most frequently used encryption software techniques are File-Level Encryption (FLE) and Full Disk Encryption (FDE). The Full Disk Encryption software is the most popular technique used for the data protection against stealing. It ensures the fulfillment of all the data breach notification and data privacy regulations. North America is projected to embrace the biggest market share of the database encryption software market in the next 5 Years after Europe. It supposed to hold about 50% of the market share in the global encryption software market. APAC is estimated to show growth at the rate of highest CAGR in the forecasted period. Different players in the global encryption software market are implementing various strategic moves. Numerous collaborations and partnerships are propelling the global market for encryption software. For instance, the Central Board of Secondary Education (CBSE) earlier announced that the board is collaborating with Microsoft India. The recent collaboration aimed at the digital encryption of Class X and XII examination question papers. This earlier initiative was commenced to boost the protection and flawless allotment of the question papers.